Description: Simple patch that shrinks the “deadzone” that the player can freely walk in before the screen scrolls. This allows the screen to scroll sooner, so you aren’t right on top of enemies when they appear on screen. May cause minor graphics issues in areas with wrapping backgrounds. 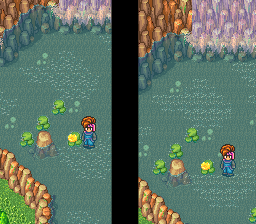 Use: On a headered “Secret of Mana” ROM. 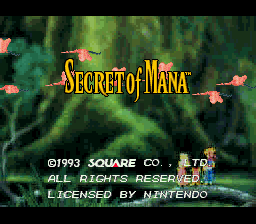 Has been tested on the 1.0 USA ROM and on a USA ROM modified with FuSoYa’s “Secret of Mana Variable Width Font Edition” hack.